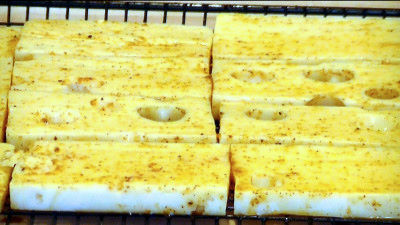 SmokingPit.com - Hickory cold smoked cheese using the A-MAZE-N-SMOKER cold smoke generator. You can change things up with adding other nuts or cheeses etc. this is more about using the bath for seasoning and the cold smoking technique. 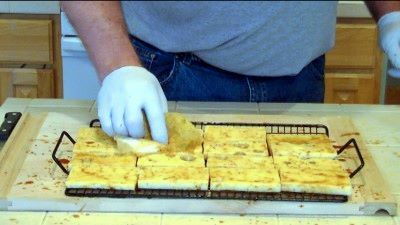 Smoked cheese is an amazing treat that is very easy to make but requires low smoking temperature. One of the best methods I have found is to use a cold smoke generator. These come in a variety of styles and costs. The unit I am using in this video is the A-MAZE-N-SMOKER. Cost is approximately $35 and it can be purchased from A-MAZE-N Products LLC Web Site. Preparation doesn't get any easier! 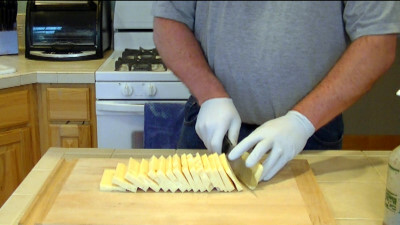 Simply cut the cheese in 1/2" to 1" thick slices. In this video I used a combination of Swiss cheese and some Pecans. The first step is to mix the Apple Chipolte BBQ bath concentrate 1/8 cup to 1/8 cup of water. In the video you see a misting bottle. Avoid it as all it did was plug up. Place the BBQ bath in a small bowl and mop it on both sides of the cheese. 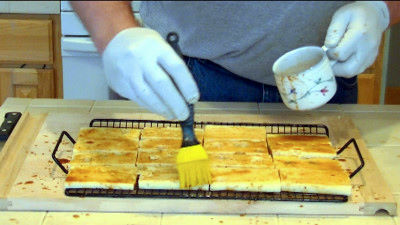 Pat the cheese dry with a paper towel, being careful to soak up liquid and leave spices behind. The rest will dry during smoking. 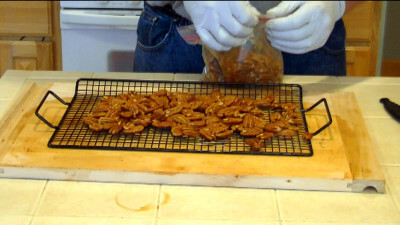 Place the Pecans in a quart size ZipLoc bag and pour in a Tbsp of BBQ bath. Zip it up and shake to coat the nuts. Pour the nuts onto a smoking rack and spread them out evenly. 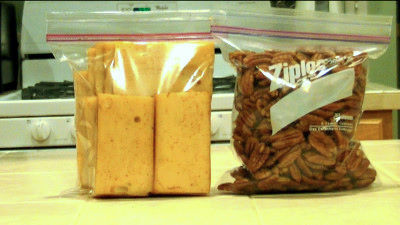 Place the cheese on smoker rack and place bothe the cheese and the Pecans into the smoker. Fill the first row of the A-MAZE-N-SMOKER with flavored pellets. Now fill the last row. We will only fill 2 rows because the pellets burn hotter and can jump into the next row and soon you will have a flare up. One row will burn about 2.5 to 3 hours. Check it later and just at more pellets to the same 2 rows and it will start burning the other way. Using a propane torch light both ends of the pellets. 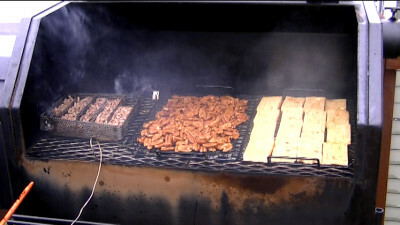 Place the A-MAZE-N-SMOKER on your smoking grate and close the lid. Open your air vents and let it smoke for 4 hours. Keep an eye out for the smoke to stop. Sometimes the pellets will go out. This did not happen on this cook. That's it! it's that easy. 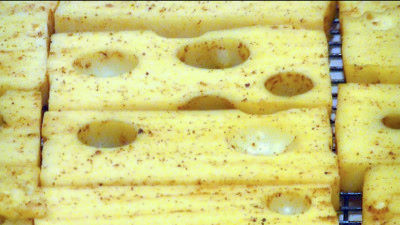 Try smoking your cheese at night when the air temperature is lower. This will produce moister smoked cheese. This can make a big difference for those living in warmer climates.